Hello again, Barbara here with some cards using the Simply Spring collection and the new polymer stamps Flower Girl and Oh, Boy! For my first card, I started by sponging a sky and grass background with dye ink. The images--from both sets--were stamped with Copic friendly ink on Doodlebug smooth white card stock, colored with Copic markers, and fussy cut out before being adhered with foam tape. The clouds are from the Simply Spring Mini Icon sheet with some card stock behind for strength, then popped up on foam. The sentiment strip is from Simply Spring Chit Chat and also adhered with foam tape. For my second card I went CAS (clean and simple). To begin, I added a strip of paper from Simply Spring 6 x 6 patterned paper pad, then added a strip of black card stock. Next I stamped up a bunch of the bee image from Oh, Boy! Stamp Set with Copic friendly ink, colored with Copic markers and cut out. 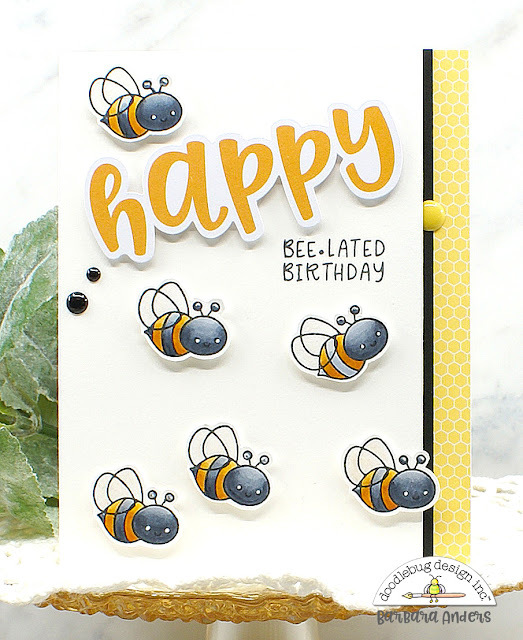 I chose the large die cut sentiment from Simply Spring Chit Chat and planned my "layout" around it. I stamped the sentiment, also from Oh, Boy! Stamp Set. then adhered a white panel with foam tape, then adhered the images, again also with foam tape. I finished off with Beetle Black and Bumblebee Sprinkles. For my third card, I first covered a white card stock card base with paper from Simply Spring 6 x 6 patterned paper in the blue wood grain pattern. Then I cut a white card stock card front, cut it with a circle die, and popped it up on the base with foam tape, then added some strips of patterned paper across the bottom of the circle. Images were stamped with Copic friendly ink, colored with Copic markers, fussy cut and arranged in and around the circle. The sentiment was stamped on patterned paper that I cut out after tracing a Chit Chat speech bubble on it. I wanted something besides white for this and it worked out great. To finish off I added some Sprinkles in Lilac, Limeade, and Bubblegum. And that's it from me. Thanks so much for stopping by! I hope you've gotten some inspiration to use YOUR new Oh, Boy! 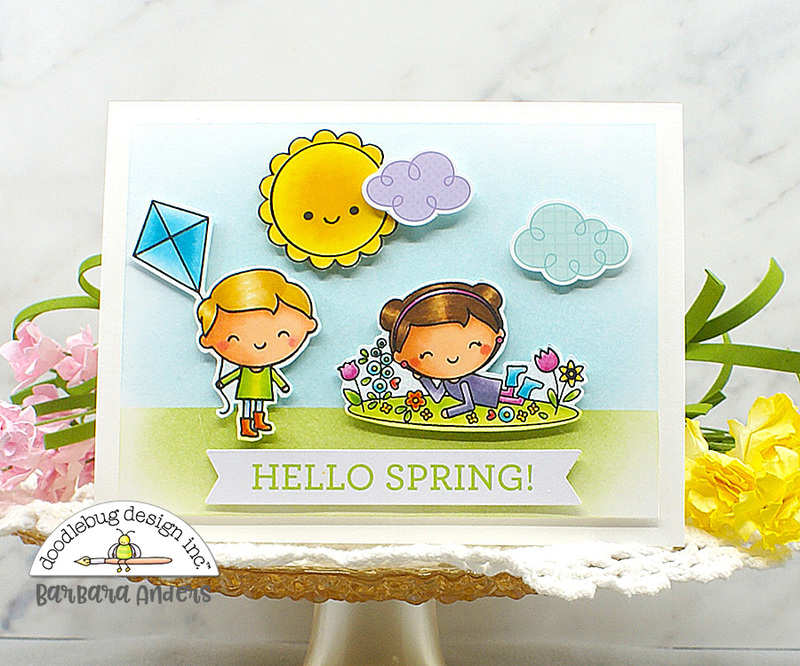 and Flower Girl stamp sets and Simply Spring collection. Absolutely adorable! Your coloring is fabulous!